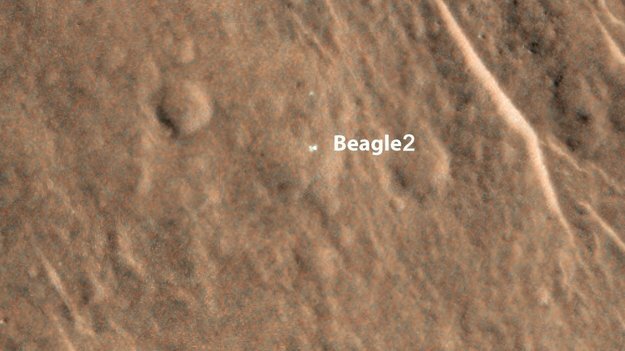 Beagle 2, the British Mars lander that lost contact with Earth when it attempted to touch down on the red planet in 2003, has been spotted 11 years later by the HiRISE camera on-board the Mars Reconnaissance Orbiter! The image disproves theories that it crashed into the surface at high-velocity and was destroyed. Previous Previous post: Quoth the Bat: Feed Me! A lot of comments in the BBC Science web site (http://www.bbc.co.uk/news/science-environment-30842576), some good, some not so good – as was said on BBC R4 news (1-30pm), all that is now needed, is pair of jump leads.